Three hundred feet beneath Geneva, Switzerland, lies the world’s biggest machine, so vast it spills over the neighboring French border — not just in one place, but in four separate locations. The Large Hadron Collider (LHC) is the biggest and baddest physics experiment ever created. Inside a subterranean tunnel, a 17-mile ring of high-powered magnets flings subatomic particles along at nearly the speed of light, slamming them together in spectacular collisions that can reveal their basic building blocks. To the untrained eye, it looks like the Death Star crammed into a mine shaft. To experimental physicists like Brandeis’ Jim Bensinger, Craig Blocker and Gabriella Sciolla, though, the collider embodies the greatest aspirations of particle physics: the quest to understand, as closely as possible, the forces that are locked inside the most infinitesimal specks of matter, and the laws that govern that matter. In a cosmic game of hide-and-seek, the LHC is allowing Ben­singer, Blocker and the legions of other physicists involved in the experiment to crack open some of nature’s most fundamental yet deeply hidden secrets. But what happens when you actually find what you’re looking for? What hidden treasure do you go after now, and where do you start the search? The discovery of the Higgs boson has left physicists exhilarated by the thrill of accomplishment, but, ironically, it may also leave them stranded without a compass, with few clues about where to go next. For the last 40 years, physicists have been slowly completing a theory called the Standard Model, a sort of mathematical field guide to the 17 particles thought to make up everything around us. They’re the tiniest bits of matter currently imaginable, with exotic names like strange quark, charm quark, muon, gluon and tau. Physicists have searched for them one by one in collider experiments over the decades and, by 1995, had accounted for nearly all of them. Except for one outlier: the Higgs boson. Named after Peter Higgs, the British physicist who predicted its existence in the 1960s, this particle is the final piece of the puzzle, and it’s a doozy. The Higgs is responsible for giving all other things mass — without it, there would be no stars, no planets, no us. Until the $7 billion LHC came online in 2008, no collider had enough power to drill down into the Higgs’ territory. This past July, however, the gargantuan machine seems to have delivered. Researchers in Geneva giddily announced they had finally gathered evidence to confirm at least a Higgs-like particle. At long last, the Standard Model, the bedrock of particle physics, seemed to be neatly wrapped up. Beyond the champagne and speeches, however, lay a more ominous notion. If the particle the LHC had found really is the Higgs, where did this leave experimental physics? Completing the Standard Model would be a monumental achievement, but one that might, in a funny twist, leave the field a bit lost. It would mean that physicists had reached the end of the road map they had followed for more than four decades, and had collectively entered terra incognita. Theoretical physicists — scientists who trade in mathematical proofs of nature — have plenty of ideas about how the universe works, at least on paper. The new question, Bensinger points out, is where to look for evidence. After all, he says, there’s still a lot about the universe that we don’t understand. A soft-spoken, grandfatherly man, Bensinger has a wry smile and a penchant for complex machines. Inside his dusty basement lab — a place filled to the brim with old electronics, spools of cable, carefully machined parts and other workshop detritus — he and his team are building sensors that help align thousands of parts inside the LHC itself. For almost two decades, Bensinger has spent one week each month at the European Organization for Nuclear Research (CERN), the international agency that oversees the collider. Along with the Brandeis high-energy physics group, he has designed and machined countless parts for the LHC’s ATLAS detector, an eight-story device used to collect evidence for the Higgs. Ask him about CERN’s announcement of the particle, though, and he’ll tell you the discovery is far from a done deal. Particle physics, he explains, is a slow and methodical pursuit. To prove this new particle is the Higgs boson, physicists still need to confirm its exact mass, note the precise way it decays (how it gives up its energy to form another particle) and double-check a long list of other factors. A delightfully unexpected discovery, on the other hand, could point the field in an entirely new direction. That would be ideal, Bensinger believes, because the Standard Model describes ordinary matter: atoms, molecules, humans, planets and galaxies. But ordinary matter accounts for only about 5 percent of the universe. The other 95 percent is elusive indeed, and — even if the Higgs does turn out to be the Higgs — offers plenty of territory for physicists to explore. The remaining 25 percent of the universe is thought to be “dark matter,” another mysterious target. Wardle notes we do have some clues about what dark matter is. After all, he says, we’ve been observing it indirectly since the 1930s. Although it’s completely invisible (hence the “dark” moniker), astronomers can measure the strong gravitational pull it exerts within certain clusters of galaxies by tracking the way they move through space. Simply tracking the gravitational effects of dark matter is one thing — figuring out its contents is the more puzzling undertaking. But professor of physics Craig Blocker thinks we may be surprisingly close. According to Blocker, this last particle shares all the qualities of dark matter. It’s invisible, and doesn’t interact with light in any way. It’s stable, so it doesn’t break down into other particles. And, most important, it has mass and, thus, a gravitational pull that can affect other atoms or particles. Right now, the neutralino is the cleanest explanation of dark matter available. But there’s a catch: We haven’t yet seen a shred of evidence that it — or any other supersymmetric particle — exists. Physicists are searching for supersymmetric particles in two very different ways. One involves building dark matter detectors deep underground (to shield them from stray cosmic radiation). If a supersymmetric dark matter particle happens to pass through Earth — which is entirely possible, since rock and dirt won’t stop it — it may fly straight into one of these supersensitive machines, registering as a tiny pulse of light or heat. So far, however, none of the dozen-odd dark matter detectors around the globe have found anything conclusive. In the meantime, Sciolla adds, we might be able to observe dark matter in the LHC — if, that is, a supersymmetric dark matter particle is created as a byproduct of one of the 600 million collisions that occur there every second. Experimentalists aren’t the only ones who want to see real evidence of supersymmetry. Theoretical physicists are also watching with interest. Associate professor of physics Albion Lawrence works largely with a mathematical idea called string theory, which claims that all matter is made up of tiny vibrating loops, or “strings,” of energy. It’s an elegant idea, but at the moment it’s completely untestable. In order to peek inside matter at these incomprehensibly small scales, you’d have to slam subatomic particles together so hard and so fast no man-made machine could possibly handle it — at least any machine physicists are able to design today. There is a sort of loophole, however. Supersymmetry is an important ingredient in some versions of string theory (there are several in circulation). So even if we can’t test string theory directly, finding a supersymmetric particle could give it traction. “The discovery of supersymmetry would give string theory a big boost,” says Ed Witten ’71, a theoretical physicist at Princeton University, and one of the world’s leading experts on string theory. 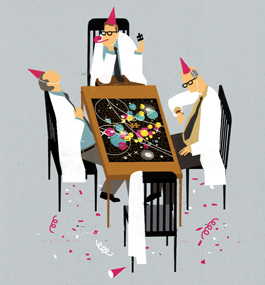 Maps or no maps, physicists are eager to voyage out in search of new worlds. “We know there are more things out there. But sometimes they are very hard to find. So you look at everything you can,” says Bensinger. “We can predict more or less what we expect to see in particle collisions, so we’ll look for deviations. Things we don’t expect. In the meantime, physicists may be facing a crisis that’s centered less in science and more in politics. Although the LHC is slated for an overhaul that may double its power within the next few years, clues to new physics may lie at energy levels that are still beyond the collider’s reach. If that’s true, the case for funding a more powerful machine that might find them would be an uphill battle. This predicament may come down to a difference in philosophy. Although advances in particle physics will extend our understanding of the universe, they won’t cure cancer, won’t fix the economy and won’t build us a better toaster. From a public relations standpoint, it’s hard to express the field’s importance to the rest of the world. Certainly, the development of new particle colliders has had unexpected windfalls. The pursuit has spawned new technologies like MRI scans and proton therapy, microprocessors, even the World Wide Web — which was first developed by CERN to share vast amounts of data among researchers. These advances affect the lives of billions of people. 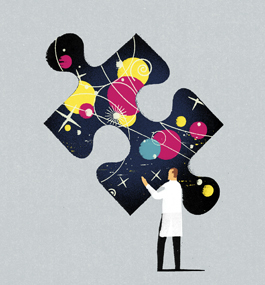 Physicists are a pretty contentious lot, but on one point, Ben­singer says, most agree: Physics is less about finding answers than about discovering new questions. Article originally written for Brandeis Magazine. Published Winter 2013.